An event is any activity that a user does in your app. With events you can track all the user activities to make smart decisions. 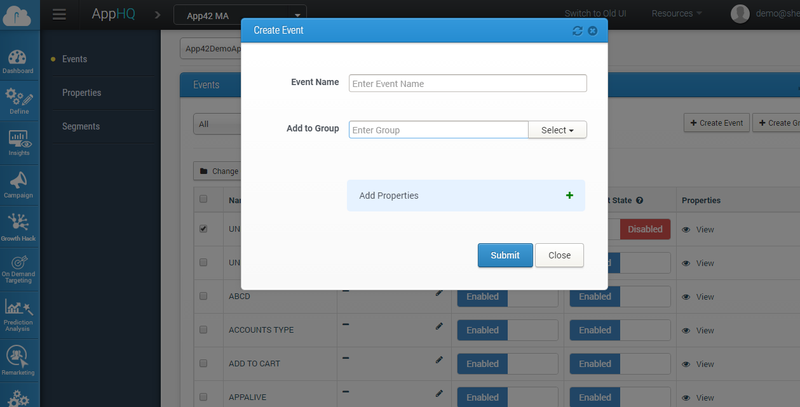 You can also assign multiple properties with any event which shall be discussed in the next section. Usually defined as time stamped records that capture user behavior, events make the foundation of analytics and marketing campaigns. For example: For a social media app, an event could be ‘update status’. 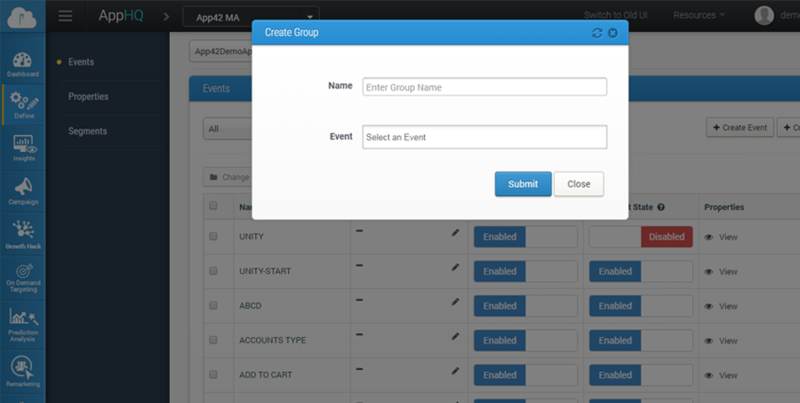 You can easily create events on the fly here with the proper name of the events which need to be tagged in the application while integration. 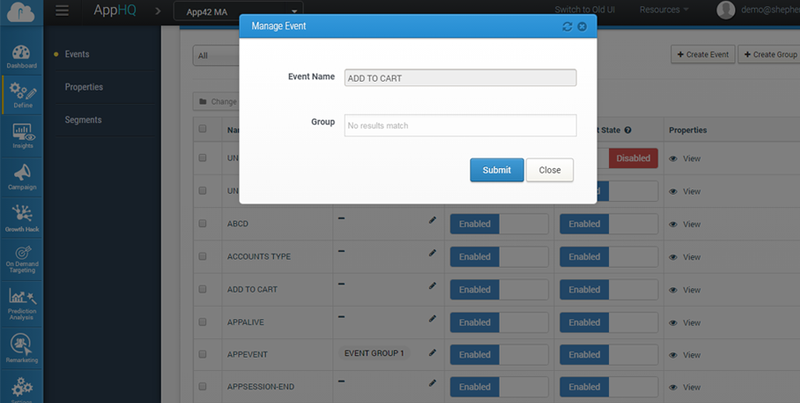 Later, these created events can be enabled or disabled as per your requirements. (a)Adding them to a new group: Events can be grouped together for making their search easier in any section of console if you have a seemingly large number of events to track. Events can also be removed from or added to already existing groups using Edit button under Group Section as shown below. (b) Soft State/Permanent State: In soft state, if you disable any event, it will not be displayed but will still be tracked. But in permanent state, disabled events will neither be tracked or displayed. Group of events can always be changed or removed at any point of time using change group option. 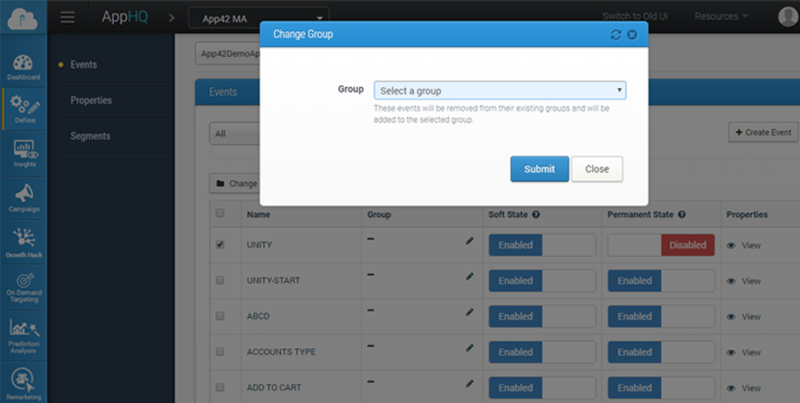 This means you can remove certain events from any group and add them to some other group anytime. Clicking on the eye icon will open up a pop up that will display all the properties associated with that particular event. We shall learn more about properties in the next section.